For over a decade Gift to Nature and its predecessor organisation worked with landowners: the Isle of Wight Council; Environment Agency; and Natural England on the management and conservation of the 200ha Alverstone Marshes SSSI. There are two particular achievements worthy of note. The first is the successful five year campaign with Natural England to raise the official status of the overall SSSI from ‘unfavourable declining’ to ‘favourable improving’ through targeted habitat restoration work with 5 landowners. The second is the extraordinary archaeological and palaeoecological find made during Gift to Nature works at Alverstone bridge in 2005. This is still being investigated by the Museum of London and the IW archaeology team but is a nationally significant find spanning Roman to Medieval artefacts and structures linked to a tidal wharf, a mill and a river crossing. On August 5th 2005 a JCB hired by the Island 2000 Trust began removing the surface of a marshy area as the first step to create a pond for water voles and dragon flies at Alverstone on the Eastern Yar River. As a matter of routine we had checked that there was no known significant archaeology over a wide surrounding area. The following day as the digger excavated deeper its metal teeth crunched onto the cobbled surface of an ancient, possibly Roman road, if so, the first ever discovered on the Island. This was just the first in a series of extraordinary discoveries that followed on an almost daily basis. Along with the ‘Roman road’ more and more structures were identified along with many human artefacts and biological records preserved intact for millennia in the peaty mud. Once the site had been disturbed archaeologists advising us said that it was not possible simply to rebury the site which was already exposed to oxygen and would soon be flooded. However as no funds could be raised anywhere at such short notice Island 2000 Trust itself had to take on the burden of financing as well as managing the project. The archaeological dig was a vast undertaking. An area of 1,887 square metres of marshland had to be excavated with fingertip care to a depth of four metres as the water table rose, the examination and processing of seven and a half thousand metric metres of wet mud. Every item had to be carefully excavated, recorded, mapped and removed for preservative processing. The dig cost the Trust £85,000 a massive debt assisted at the time by generous donations from the local community and since reduced with the help of the Area of Outstanding Natural Beauty IW, English Heritage, Environment Agency, Heritage Lottery Fund the IW Charitable Trust and the Idlewild Trust. What was recovered constitutes the greatest archaeological discovery since the discovery of nearby Brading Roman Villa. The finds include an extraordinary network of worked, carved, jointed and drilled wooden causeways held down by long oak dowels that are surmised to be from the Iron Age (700BC) to Saxon (1066). 1,840 wooden components were recovered including 345 shaped stakes and posts, planks wedges and dowels including the huge oak stakes used to hold together the ‘Roman road’. Among the hundreds of associated finds were sackloads of flint cobbles, pottery and glass, iron and copper alloy objects including clasps, buckles, bracelets, nails, fasteners, spear heads, crossbow bolts, coins and pen nibs. One coin neatly dates the associated finds to 300AD. Another is Saxon. The organic remains included animal bones, pollen, leaves, fungi, seeds and even spiders, all miraculously preserved in this giant peat time capsule. 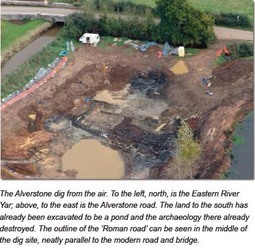 One of the most extraordinary facts of the Alverstone dig is the sheer number of structures. One report surmises that there are seven identified phases of construction: “timber alignments and associated planking suggest at least four Iron Age Causeways were present” A semi-circle of upright timbers with interwoven hurdles suggest a fish trap. Seven separate platforms were identified providing a “network of timber walkways”. Once unearthed these thousands of objects were despatched to specialist centres for safe storage and analysis. The timber has gone to Flag Fen Wetland Archaeology Centre in Cambridgeshire, the metal objects to the York Archaeological Trust and the biological remains to the University of Portsmouth. The importance of such a variety of finds on a single site is of international importance. The biological material alone will allow archaeologists to recreate not only a picture of the flora of the ancient Wight, but also its climate. However the analysis will take years and the interpretation will likely go on for decades. In the meantime, as we await the results, can we can make some intuitive guesses? Do the finds suggest a maritime Alverstone? As structures, they resemble the post alignments, causeways and fish traps discovered in the mud offshore of Wootton-Quarr-Seaview in recent years. 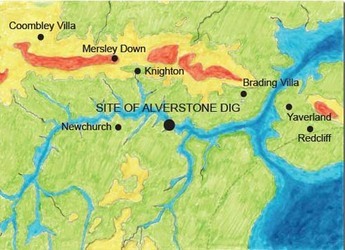 However Alverstone is 5km from the mouth of the river. At first this seems nonsensical, but then it allows us to recreate the then greater inner shoreline of the Island, just as the offshore archaeology is telling us how the Island seashore shrank over time. The rising of sea level that followed the last Ice Age (about 12,000 years ago) not only flooded the Solent Valley about 8,000 years ago but also flooded the river valleys feeding the Solent River, most notably the Itchen-Test Valley, now Southampton Water, and the estuaries of the lower Medina, Wootton and the West Wight. Upstream we can see the silted up historic traces of this in our geology, in the layers of alluvium deposited high up the Medina and Eastern and Western Yars. Alverstone and the offshore finds show us that at the time these finds were created the Island was much larger, the Solent much narrower (as the mainland coast was much closer too) but that a large part of the interior of the Island was covered twice a day by the high tide, creating the former “Isles” of Bembridge and Freshwater. In this Wight of 1,000 to 3,000 years ago, Alverstone was possibly the equivalent of modern Newport, the lowest point on the Eastern Yar where the river could be crossed by road and the highest point that sea vessels could reach on a high tide before settling in the mud for unloading and loading. This could account for the range and volume of goods, such as pen nibs (styli) and weapons, which otherwise seem out of place in this rural setting. Trade across the seas had been important to the Island since the beginning of the Bronze Age, about 2,300BC. If the Island was to share in the benefits of using the new metal technology it had to import it by exporting goods or services, as no metals occur in the geology of the Island. Stone Age agriculture had become well established about 3,500BC and the Island probably bought metal imports through farming exports as well as quarried stone and later Island pottery. The Iron Age built on the agricultural achievements of the Bronze Age. This period saw the development of a sophisticated Celtic culture, trading with metal coins and starting to develop major towns. The many causeways discovered in the excavation, including the ‘Roman road’ which is itself an “existing Iron Age Causeway within a Roman constructed causeway” all suggest that Alverstone was a significant trading centre in the Celtic Iron Age, something which the Romans simply inherited. The Roman finds are in themselves interesting. For the first time we have evidence of a military presence and the styli suggest there was a literate part of Vectis society. Further excavations at Brading Villa, 2km from Alverstone may bring to light further insights into life on Roman Vectis.The ‘Roman road’ is another first. Its direction suggests it continued as the Alverstone Road to the south towards Wroxall and north to the footpath ultimately to Nunwell Farm or Spring Vale, crossing the important ancient east-west highway along the top of the downs. For the first time we perhaps see a fraction of the road network of the Celtic-Roman Wight? We must now await the specialist analysis of the funds for further news. A geophysical survey (using a sort of underground radar) could be useful in tracing some of the underground structures, to see if any more have survived and pinpoint where further digs could in future take place. Surely this important site deserves further attention? Land over 100m is shown in red, land over 50m in yellow. Iron Age/Roman archaeological sites are named. The blue indicates the high tide peak of the post glacial flooding. The coastline is shown 1km further out to sea, which is where it may have been about 2,000 years ago. Many of the more inland waterways would have silted up by this time but it easy to see that Alverstone was possibly a tidal port. The Cowdray engraving of 1545 still shows the ‘Isle of Bembridge’ separated by the high tide.